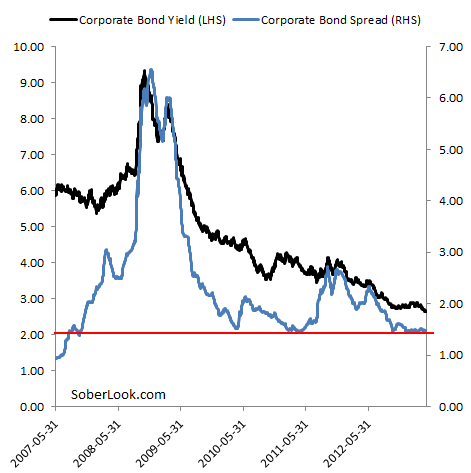 Sober Look: A natural floor on corporate spreads? A natural floor on corporate spreads? US corporate yields hit another record low on Friday. The Merrill Lynch US investment grade corporate bond index yield is now at 2.64%, while high yield is at 5.35% - both are at an all-time low. The spread to treasuries, particularly in investment grade (IG) bonds, is no longer declining. In fact IG spread tightening has stalled at just under 1.5% support level (chart below). Since we've never been at these yield levels, this is uncharted territory in corporate bond pricing. Certainly bond spreads have been lower in the past - especially during the boom years. But in the post-crisis era, corporate spreads seem to have found a floor. Typically as US equity markets rally, corporate spreads tighten in tandem. Higher stock prices usually indicate lower default probabilities and therefore lower spreads. 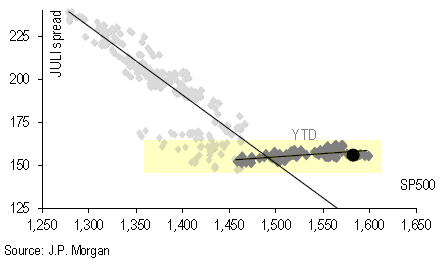 But as JPMorgan analysts point out, recently that relationship broke down and corporate spreads have flat-lined. (note that JULI represents a different set of bonds than Merrill's index - therefore a slightly different floor). Does this "natural floor" in spreads limit how low implied corporate default probabilities can go in this environment? Anecdotal evidence suggests that investors who buy these bonds are not as concerned about defaults as they are about rising rates. On a seven-year corporate bond, it will take only a 25bp increase in yield to wipe out a whole year's worth of spread income. On the other hand a 25bp rate decline now seems far less likely (7-year treasury yield - now at 1.07% - has found a floor at around 100bp). The rate risk is perceived to be "asymmetric" in these markets. Investors therefore demand some minimum cushion spread to treasuries to compensate them for the risk of rising rates. Consequently, as long as investors remain concerned about rising long-term rates (see discussion), this floor on corporate bond spread should persist.